Costa Rica has a lot going for it as a place to live and retire: Natural beauty, exotic wildlife, warm weather year-round, beautiful beaches, warm and welcoming people…the list goes on. But one of the most attractive features of life in this tropical Central American country is the lower cost of living. Retired couples average about $2,000 per month in expenses, including housing, transportation, food, and medical costs. I know some couples who spend as little as $1,500…and even $1,200 a month. You will not reach that low level of spending if you buy a lot of imported items at the grocery store or need to have the latest electronic gadget when it comes on the market. Imported items are expensive in Costa Rica due to heavy customs duties. On the flipside, neither will you have to subsist on rice and beans. You can live a great lifestyle on a low budget with plenty of travel, fun with friends, and more…if you know the tricks. Here are five ways to cut your cost of living in Costa Rica. Local ferias, or farmers’ markets provide fresh-off-the-farm produce at affordable prices. 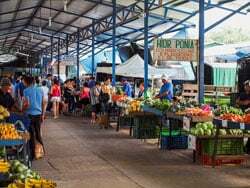 In just about every Costa Rican town there is a weekly ritual for residents: a shopping trip to the feria, or farmers’ market. It’s where locals load up with fresh fruits, vegetables, and herbs. You can also pick up dairy products, fish, chicken, beef, pet food, honey, flowers, coffee, bread…basically anything not processed and put in a box on the grocery store shelf. It’s fresh-off-the-farm and affordable. Lettuce is 50 cents a head; Pineapples: $1.50; Avocadoes: four for $2. Expat couples usually spend about $25 or so for a week’s worth of food. Plus, going to the feria is fun, with the vendors offering free samples and calling out deals all surrounded by tables piled high with produce. You’ll find plenty of fast food in Costa Rica. McDonald’s, Pizza Hut, and such all have a big presence here. And in the larger towns, especially tourist-oriented beach towns and the capital, San José, you can also find plenty of gourmet options. But the prices at these places are about the same as the U.S. If you want to eat affordable, healthy food when you dine out, just like at home (remember, you’ve been shopping at the farmers’ market), you have to eat out like a local. And that means patronizing the small neighborhoods restaurants known as sodas. These places all have basically the same menu with little tweaks here and there. The casado is the national dish. It features rice, beans, plantains, salad, and your choice of meat, chicken, or fish—about $4 a plate. You can also get arroz con pollo—chicken with rice—or other similar dishes. And ceviche is also a popular choice. It’s fresh fish “cooked” in lime juice and served with chopped onions and peppers—about $5 for a healthy portion. The bus network in Costa Rica is widespread and efficient. You can get from outlying areas into town, around town, from town to town, and across the country easily on the bus. Many Ticos don’t have cars or maybe just one for the household, so the bus system is well-used and appreciated. These aren’t “chicken buses.” Everybody gets a seat. It’s a modern fleet operated by a variety of private companies and it’s comfortable. 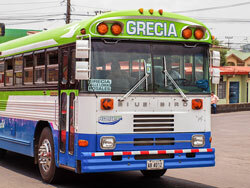 The bus network in Costa Rica is affordable, efficient, and widespread. Costs are low, about 75 cents for a local bus, $2 if you’re traveling a half-hour to an hour to another town, or $8 to $10 if you’re going across country. Local buses run every hour or half-hour, though larger cities have more frequent service. If you’re in a rush or carrying some heavy bags back from the market, taxis and private transportation companies are widely available and low cost, too. For example, a ride from the market where I live in Grecia to my home up in the hills above town about 20 minutes away is $6 to $8. For this reason, many expats never get a car. Costa Rica is a country where the older generation is treated with respect by custom. And things like head-of-line privileges at banks and government offices are inscribed in the law. But there is also a government program available to those age 65 or older, which gives discounts on a variety of products and services. With a Ciudadano de Oro, or Gold Citizen card, you get free bus rides on local buses, as well as 5% to 50% discounts (though most are between 10% and 20%) on prescription and over-the-counter medication, groceries, eyeglasses, clothing, and more. 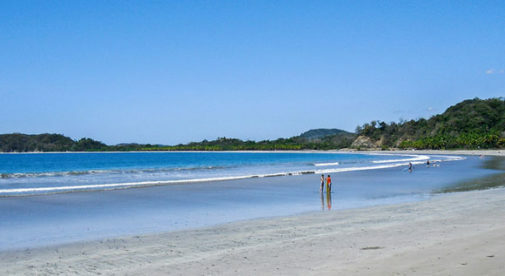 Many expats in Costa Rica have taken the opportunity when moving there to simplify their life. They shed a lot of the “stuff” that they don’t really need. Instead of shipping a container of furniture, knick-knacks, and clothes, they bring only what will fit in the luggage they bring on the plane. They choose wisely, bringing some favorite kitchen tools, for example, or treasured mementos. And when it comes to their home, they scale down, too. Instead of spending more to buy a bigger place with all the luxuries and bells and whistles, they get something smaller but comfortable and then outfit it as needed by buying locally. With rentals, it’s even easier. Many come furnished, down to the sheets on the bed and the plates in kitchen cabinet. The great thing is that real estate, whether you rent or buy, is very affordable. Some recent listings include a three-bedroom home with beautiful view of forest and farmland, fully-furnished, in the Central Valley town of Grecia. It rents for $650 a month. Another three-bedroom in the same area, also with a great view, is for sale for $150,000. Those prices are typical of the Central Valley region, though you can also find plenty of great deals in coastal areas, too.